Not long ago, I talked a little about getting started with Zentangle. I had just received Yoga for Your Brain, by Sandy Steen Bartholomew and was all excited about the ideas and presentation. As always, I recommended the Zentangle Primer by Rick Roberts and Maria Thomas, Zentangle founders (available from Zentangle.com for $49.95) as the first book to get. Because it is an investment, I suggested One Zentangle a Day by BeckAh Krahula (available from Amazon.com in paperback for $13.79, or Kindle version for $12.99) as the second best option. 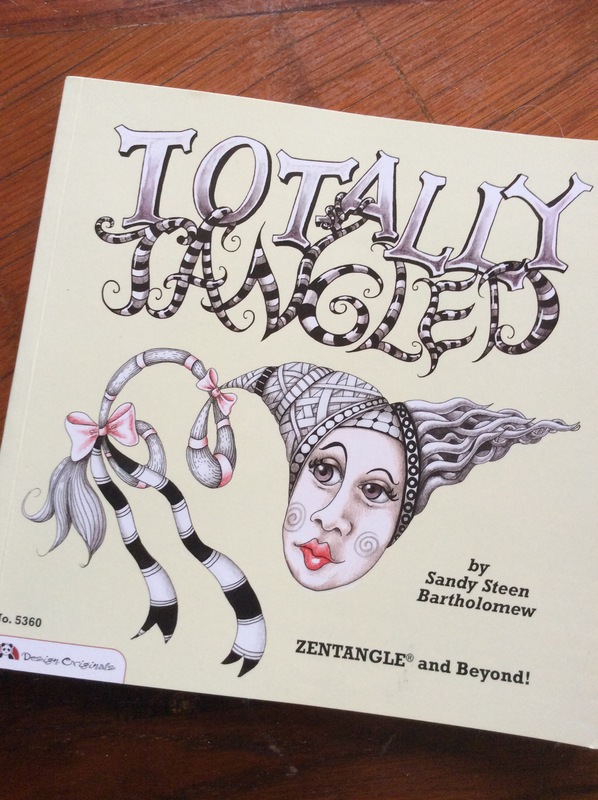 I was waiting to receive Sandy Bartholomew’s first book on tangling, Totally Tangled, to see if it was an equal to Ms. Krahula’s book, or maybe even better. Based on the Yoga book, I was expecting a sensational introduction to Zentangle in Totally Tangled. Totally Tangled finally arrived in our mail late last week. Totally Tangled is a great book, filled with a lot of patterns and advice about creating tangled art. At less than $12 on Amazon, it is a great value for the ideas alone. But… Although it introduced the Zentangle Method®, there was little in the way of follow-through in terms of the ceremony or process of Zentangle. It deals very briefly with the relaxation and meditation aspects of Zentangle. The textual content tends to be an overly frugal summarization of the Zentangle Method, philosophy, and process. However, the photographs and drawings are sensational, especially to those who have absorbed much of the whole Zentangle process. Totally Tangled came out before Yoga for Your Brain. It contains a lot of information about drawing and creating patterns, enhancing scrapbooks, repurposing old ceramics and “outgrown” household goods. It even offers some great ideas for involving children in drawing with tangle patterns. Yoga for Your Brain picks up and expands on these ideas and adds a bit more information, lots more new patterns, and several new and different project ideas. Neither volume, separately or together, comes close to the wealth of information and ideas presented in either the Zentangle Primer or One Zentangle a Day. As I stated in the previous post, if the purpose is relaxation and meditation but money is a main consideration for initial outlay, One Zentangle a Day is a great value. It costs about $2 more than either of the two Bartholomew books, and contains more information on techniques, art enhancements, and the relaxation/meditation aspects than the two Bartholomew combined. In short, my feeling is that Totally Tangled is excellent if the primary purpose to its purchase is as an idea and inspiration book. I would recommend it as a great supplement to either the Zentangle Primer or to One Zentangle a Day, but I would not recommend it as a “first Zentangle book,” unless the reader’s main purpose for purchasing it is to freshen art or add to one’s repertoire of arts and crafts projects. That being said, all these books contain lots of patterns and art ideas, with the Bartholomew books topping the other two in sheer volume of imagery. The artwork alone makes both Totally Tangled and Yoga for Your Brain a great investment for supplementary ideas and art inspiration, whether the art is Zentangle or more traditional art forms or crafts.